OK - hands up all those who put their heating back on this week or dug out their thermals from under the bed ..... It's almost the end of May and I am back in my thermal t-shirt! I had put it away at the back of the airing cupboard a few weeks ago but I was driven to haul it out again this week. Thursday afternoon driving to Faversham in a torrential hailstorm I saw 0 degrees on my van display and the traffic news reported that several roads in Scotland were closed because of heavy snow. Can you believe it? At least today was a bit warmer for Wimbledon market and Ellie's Dairy had a good morning there, selling plenty of cheese and our delicious goat meat. It is lovely to be back at market with a complete range of cheeses! Our goatlings have apparently settled very well into their new home in Herefordshire. Although there are still 40 left here (and 7 little meat boys), their barn does seem rather empty. And quiet. As our buyers wanted mostly British Toggenburgs and crosses, most of the brown girls have gone. There are a lot of white and black goats left here now and they are much more well behaved than those thuggish naughty brown things! And they also seem to eat much less hay ... I think we have sent all the piggy naughty ones off to Herefordshire! Of course, we still have little Fizzy. Apart from the fact that she wouldn't be any use to them, she is rather special and I couldn't let her go. Do you reckon that she's grown at all since our last update?? Things went downhill in the middle of the week as we had to have our beautiful Wendie put to sleep. She had been suffering with what looked like a respiratory infection for a couple of weeks but was not improving despite medication and was starting to lose weight as she was not eating properly. I took her into the surgery and, after lengthy examination, Peter said that it would be best to send her to the big goatshed in the sky. He was pretty certain that she had developed some kind of tumour which was affecting her whole chest area and he didn't really hold out much hope for her. It was the best thing to do for Wendie but it's always so awful to take that decision. Wendie and I had one last cuddle and I held her in my arms as she drifted away. On a lighter note, young Valerie decided that she would like to come into the milking parlour tonight and so her two little men came skipping along with her. The brave black boy stood and ate his dinner from the trough like a grown up whilst, as you can see, his white brother decided to take advantage of the situation and sneak a quick slurp while mum was occupied! It is interesting to see that the black one is virtually weaned now - it is very rare that you see him feed off mum. The white boy still likes to feed, although this is also getting more infrequent as well. It's nice to know that we are weaning the rest of the babies at the same size as these two are being weaned naturally by mum. And, just in case you think that we spend all our time doing goatie things .... last Sunday we went out for a very nice lunch with our best friends Iain and Linda who were visiting from Somerset. Yes, I know ... WE WENT OUT FOR LUNCH. Hard to believe, but there it is. And very pleasant it was too. 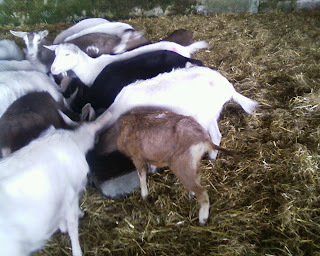 Nice to see the goaties let you have some time off for 'good behaviour'. Will bring sunshine back with us on 8th June - if you can wait that long. "Wouldn't be of any use".. excuse ME! Did I read that correctly? Dear Fizzy would make them laugh, that is for sure and with weather such as WE and YOU are experiencing in the week before 'Summer' officially starts, I would say that is what WE all need, a lot of laughs, because WE find it pretty dismal - to put it politely! WE need LOTS of Fizzy's..